MISSISSAUGA, Canada, May 31, 2017 – Glasvan Great Dane (www.glasvangreatdane.com) is proud to announce that two of its employees were named winners of the Great Dane King Pin Awards for their exceptional sales achievements and for delivering outstanding customer experiences. 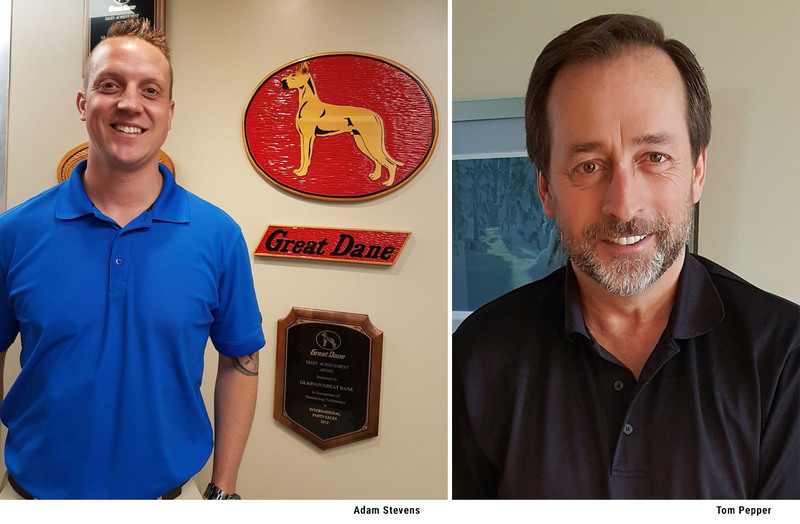 Great Dane recognized Glasvan sales representatives Tom Pepper and Adam Stevens for their sales excellence. This is Tom's ninth Great Dane King Pin win and Adam has been declared a five-time achievement earner. Five King Pin awards are given every year to a pool of 150 sales professionals in Canada, Mexico and central and south America, and only three people have ever been selected for the highest honour of winning a King Pin award nine times. "I'm very proud to have won this award for the ninth time," says Tom Pepper, Sales Representative for Glasvan Great Dane. "The people at Glasvan always strive to go above and beyond by providing excellence to our clients in every interaction. In order for us to sell, we continue to provide the utmost in quality and customer satisfaction. My goal is to go beyond just selling the Great Dane product. My goal, along with everyone else at Glasvan, is to deliver on our promise of selling quality product and treating our customers with the highest level of integrity." The King Pin awards for sales continue to be the most competitive among the Great Dane community and it has widespread adoption among the dealers. Every year, sales professionals who work for the North American Great Dane dealers are graded on their sales performance, their paper work, their overall disposition towards the people they work with, and going above and beyond customer expectations. "The King Pin award means a lot in the Great Dane community, and I am truly honoured to be a five-time repeat winner," says Adam Stevens, Sales Representative for Glasvan Great Dane. "To me, this award signifies much more than just sales, and the fact that we won two this year out of five that are awarded every year, demonstrates that Glasvan's company values, collaborative culture and customer-centric approach speaks well to the people who buy the truck trailers. We truly pride ourselves in being aligned with our customers' needs." The Kingpin awards program started in 1989 to recognize sales excellence in the category of direct sales national accounts among the salespeople who work with the Great Dane dealers in North America. Only five are given out among the 40 Great Dane dealerships every year, and they are Great Dane's top honors for sales professionals in the category of business development and customer service. Glasvan Great Dane (www.glasvangreatdane.com) has been in operation since 1981. The company's philosophy of "Better Equipment. Better Service." has made them the highest volume Great Dane trailer dealership in the world. It also offers high quality new and used equipment from Autocar (shunts), Etnyre, Landoll and Chaparral. Glasvan operates from five southern Ontario locations with 27 service bays, 24,000 square feet of parts warehousing plus full sandblast and paint capabilities. Magazine about trucks, cars, and ground transportation. Published monthly and distributed in the Greater Toronto Area, provinces of Ontario and Manitoba. • Mack Trucks Stakes Highway Claim with All-New Mack Anthem™ Mack Trucks introduced its new, next-generation highway hero, the Mack Anthem™, during the Mack Global Dealer Summit in Allentown, Pennsylvania. The Mack Anthem is a re-engineered, redesigned and reimagined interpretation of what today′s highway truck should be – aerodynamic, comfortable and connected, all with a distinctively bold Mack look. • TIPS AND TRICKS 4-ways to find a great load An owner-operator offers some of his tried-and-true tricks for finding great loads on the load board. • 2013 HOS Rule Is Gone for Good. The 2013 version of the 34-hour restart rule required drivers to be off-duty for two periods from 1AM to 5AM before they could go back to work, and the restart could only be used once per week. • Where to Find Loads in the Slow Season February is the slow season for freight, and it may feel like your business is at a crawl right now. • The Freight Recession is Over. 2017 Outlook: The Freight Recession is Over. • "Beaver" speaks many languages. DorogaRoad interview with "Beaver" Sales Rep.
• Industry Trends by DAT. Industry News by DAT Truckers Edge. • Caravan first Canadian fleet to deploy BlackBerry Radar. Caravan Transportation Group is the first fleet to roll out BlackBerry's Radar asset tracking system. © 1998-2019 , DorogaRoad.com. All rights reserved.